It is clear that the climate is changing rapidly. The Chesapeake is already being affected by sea level rise, severe weather and other aspects of Climate Change. But what does this mean to the average person? What, exactly are the international agreements all about? Can the science be explained in a common-sense manner? How will this affect my health? Is there anything we, our communities, and our local governments can do to be resilient in the face of a changing climate? Annapolis Green and Presenting Sponsor Hannon Armstrong are offering a year-long series of talks entitled “Tread Lightly on the Earth” to address these essential questions and other related issues. The first talk, “Climate Change 101: What Does it Mean to Me?” will be held on Wednesday, March 27, 7 p.m., at the Annapolis Maritime Museum, a fitting location as it feels the effect of sea level rise on a daily basis. Expert speakers will explain the accelerated pace of Climate Change in simple language, address the topics of adaptation and resiliency, answer questions, and engage in a two-way discussion with the audience. The goal is to inform and leave attendees with optimism about steps they can take at home and at work to mitigate the impact of Climate Change on themselves, their families and their communities. The moderator is Dave Buemi, who has been commissioned by the Post Carbon Institute which is focused on providing communities with solutions to meet the climate change challenge at the local level. His work over the last 22 years in solar and renewable energy globally provides a unique perspective on the challenge of energy as the main driver of climate change. 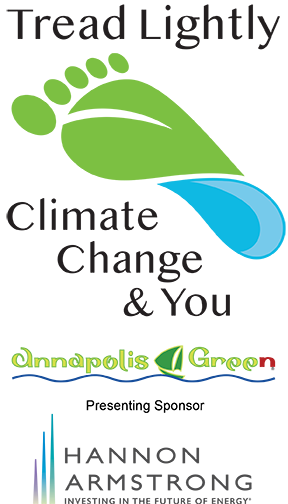 Presented by Annapolis Green, hosted by the Annapolis Maritime Museum, with support from the Smithsonian Environmental Research Center, the Climate Stewards of Greater Annapolis, and the City of Annapolis. Presenting Sponsor Hannon Armstrong (NYSE: HASI) focuses on solutions that reduce carbon emissions and increase resilience to Climate Change by providing capital and specialized expertise to the leading companies in the energy efficiency, renewable energy and other sustainable infrastructure markets. Hannon Armstrong is only New York Stock Exchange listed company headquartered in Annapolis, and is the first U.S. public company exclusively focused on financing solutions to Climate Change.